So, Apple announced new iPods today and I really want an iPod Touch. I have mixed feelings about the new iPod nano: it seems a little too fat and the screen is still too small to watch videos, but the price drop is nice. They also dropped the price of the 8GB iPhone to $400 and dropped the 4GB iPhone completely. The new "iPod Classic" received a new look and a storage bump to 80GB and 160GB. All in all, though, I'm the most excited about this new iPod Touch. It comes in 8GB and 16GB sizes (flash memory) for $300 and $400 respectively. It has the same touch interface as the iPhone, has WiFi built in, and has the accelerometer just like the iPhone so it knows when you put it on its side and changes the view of the display accordingly. 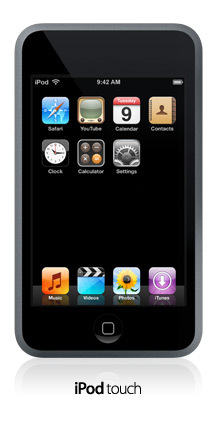 So, if you want to make my birthday/Christmas, buy me an iPod Touch ;-). Yep, I took the guided tour, and I must admit it's pretty sweet. Too bad it costs an arm and a leg.